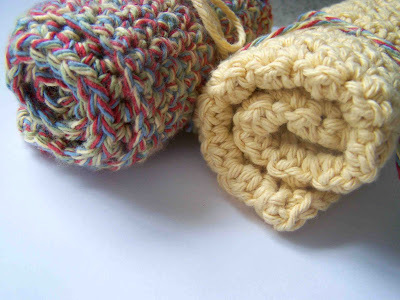 When I decided to learn to crochet, I asked for suggestions on good beginner projects. Many suggested scarves, baby blankets, and wash clothes. Wash clothes are boring right? You spend all of your time making something that is going to be cleaning up messes (not my favorite activity). The truth is though, they really are an ideal beginners project. 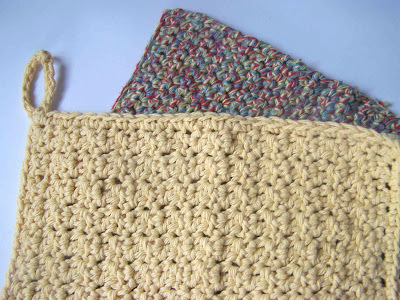 You spend your time practicing basic stitches, and when you're through, if the project doesn't turn out perfectly, you haven't spent much time or money on it. Plus, you can still put it to good use. I actually love my knitted/crocheted dish clothes. They do a great job. I can now cross wash clothes off my list. 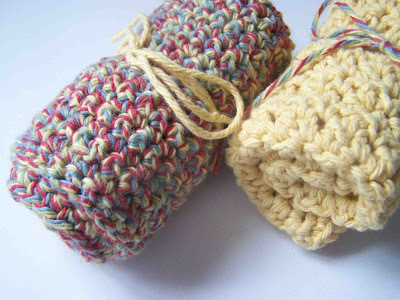 The first one I made was the multi colored single crochet wash cloth. You can find the free pattern here. 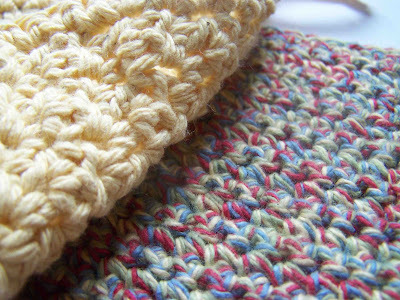 It is a really nice wash cloth, but was a little bit of a snooze. I much preferred the yellow wash cloth (pattern here). It involves both single and double crochet. I don't know why it made it so much more enjoyable, but it really did. It also adds a bit of texture to the cloth. If you have a certain # that are square, they can be crocheted together to form an afghan.